Corbyn’s Cove Beach is situated in Port Blair, the landing point and the node of connection of Andamans to the other main lands. Hence the beech is crowded with enthusiastic tourists who have just started their Andamans vacation tour or by those who round up the tour with a visit to the Corbyn’s Cove Beach before leaving the islands after completing their trip. Corbyn’s Cove Beach is just 8 kms from the busy city centre of Port Blair. The drive to the beach is exceptionally beautiful with the elevated lands to one side and the extended warm seas on the other side. The beach itself is flankedby lush green coconut palms. Take a lazy stroll along the beach and sip at the fresh green coconut from the shacks present on the beaches. Collect the beautiful pieces of knick knacks and souvenirs and mementos from the shacks on the beach side. The beach provides ample scope of entertainment options. You can skim the lucid waters in a jet ski or a motor boat and feel the enchantment of the seas and the cool breeze. Laze on the beach with a relaxing drink with your friends at the quaint little café on the beach front. Take a dip in the refreshing waters. The beach provides clean and well-maintained changing room facilities. You can choose to stay at the beach side hotel to have a stunning view of the endless blue seas. Corbyn’s Cove Beach does not stand much chance when compared to the far flung secluded beaches of the other scattered islands but it does provide a pleasant respite from the hustle and bustle of the main island city. 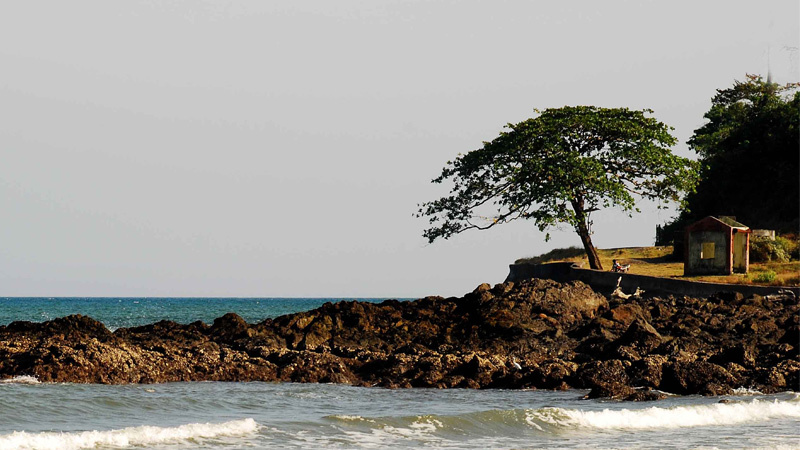 It is a must visit place while in Port Blair and is always included in the day sight-seeing itinerary. From the Corbyn’s Cove Beach, you can venture out into the nearby Snake Island. Snake Island as the name suggests harbours a lot of deadly snakes. This island is otherwise known for the beautiful corals, colourful fishes and rocky coastline. Motorboats connect the Corbyn’s Cove Beach to the Snake Island.